Treat yourself to an Autumn retreat and be one of the first guests to check-in at the new naked Stables Private Reserve. The sustainable luxury spa resort and equestrian reserve in the beautiful Moganshan hills in Zhejiang Province, two and a half hours from Shanghai, will open its doors on October 1, 2011, and it is offering unbeatable introductory rates for October and November. The special discounts are even available during China's October National Holiday – when the rejuvenating bamboo forest makes an ideal escape from the city. Take advantage of the following one-for-one deals and specially designed packages for couples, families and groups of friends. In addition to their own unique benefits, each package also includes complimentary Wi-Fi throughout the resort, access to all main swimming pools, extra weekend activities and personalised service from your own host. Escape to the naked Stables Private Reserve in October or November and you can double your pleasure. Stay for one night and get an extra night absolutely free during its first two months. With this offer, prices starts from RMB 2,600 per room for two nights, plus 15 percent service charge and including Western breakfast. If you only have one night to spare, you can take advantage of the Weekday Package at naked Stables Private Reserve that includes 30 percent off accommodation, plus complimentary Western breakfast, lunch at the Clubhouse Bar & Bistro and a gourmet dinner at Kikaboni, the Afro-Chinese signature restaurant. 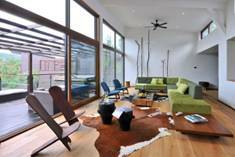 Priced at RMB 1,331 per person per night (minimum two people), plus 15 percent service charge. Unique Weekend Packages are tailored for families, couples or groups of friends. Spread across 60 acres with plentiful activities, naked Stables Private Reserve lets you be as active, social or private as you desire. Weekend stays kick-off every Friday night with a social African Welcome Barbecue and Bonfire at the poolside Clubhouse, with entertainment, music, great food and company. naked Stables Private Reserve is set on 60 pristine acres in its own private valley surrounded by a reservoir, bamboo and tea plantations, and small farming villages. It has been built with the aim of becoming the first resort in Asia to achieve the highly coveted LEED Platinum sustainability certification. 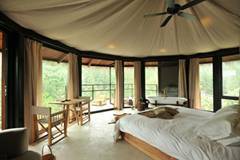 The 'sustainable luxury' resort features 121 beautifully appointed rooms in free-standing Tree-Top Villas and Earth Huts, plus Afro-Asian restaurant Kikaboni (meaning 'organic' in Swahili) and Clubhouse Bar & Bistro. 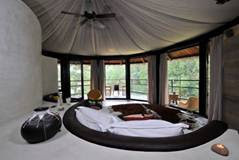 The resort also features a 750 sqm naked Leaf Spa & Wellness Centre; three outdoor swimming pools; a Tea Pavilion, Bamboo Museum and Pottery Studio; Little Shoots Kids Club; and a fully equipped Equestrian Centre with operational stables for 20 horses. An 800 sqm Conference Centre, Indaba (an African word meaning 'gathering of the chiefs'), offers seven multi-functional meeting rooms. Founded by South African Grant Horsfield, the naked concept was conceived to communicate the philosophy of stripping away a busy cosmopolitan city lifestyle and restoring balance through closeness to nature. naked Retreats aims to become a leading global brand for sustainable nature retreats by giving guests unique and rewarding personal experiences in stunning natural environments. The company is committed to working with communities in and around the resort locations, by generating job opportunities, contributing to local economies, and sharing with them a sense of pride and fulfillment. The first naked Retreats resort – called naked Home Village – opened in 2007. It comprises eight hillside homesteads in the village of Sanjiuwu surrounding Moganshan in Zhejiang Province, China. naked Stables Private Reserve will be naked Retreats' second resort in China, and will open in October 2011.